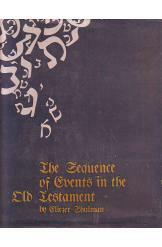 The Sequence of Events in the Old Testament by Eliezer Shulman, album format, 28 x 28 cm, 180 pages in English. Numerous maps, illustrations, graphs throughout the book. For this book the author developed a graphic chronology and genealogy of the Five Books of Moses (the Pentateuch). This monumental work details the major characters and events mentioned in the Bible.